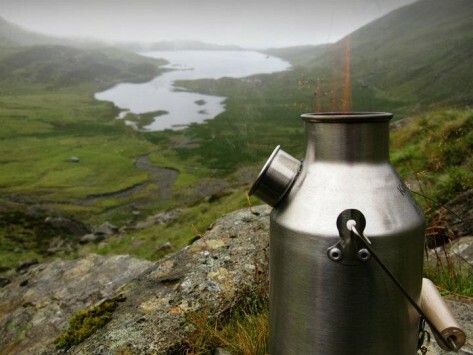 Quick and easy to boil water, even in extreme weather conditions. Since only natural fuel is used, you don’t have to worry about carrying gas, batteries, or other types of fuel with you. Scout set includes Stainless Steel Cook Set and Scout Kettle. This is everything it's said to be. Takes very little fuel to boil water and create a nice flame for cooking/heating. Very easy to use. Boils water fast and cooks food in a control fire stack. This was purchased as a Father's Day gift for my husband who has taken up backpacking. It looked like the perfect upgrade to his hobo stove made from a cat food can. After making the purchase, I discovered that there is a separate Kelly Kettle site that has a variety of "kettles" from the trekker, designed specifically for the back packer, to the super large kettle for weekend group camp outs. Had I realized that there were greater choices, I would have chosen the smaller trekker model. The hubs was not enthralled with the Scout model...to big, too heavy for his purposes and sadly, it is being returned. There are two issues learned from this experience: first, the sets have all been upgraded to a stainless steel base so the Kelly hobo stove (extra accessory) can be used. This set did not come with the upgrade. The second is cost for returning is$21.00! This has been a very costly learning experience. Dealing with the supplier directly is no better..15% restock fee plus shipping both ways. I have learned (again) the costly lesson or remembering to check the return policies and fees prior to ordering.